After Mamata Banerjee's declaration of a separate district for Kalimpong, the Kamtapur Progressive Party (KPP), which has long been demanding a separate state, as well as recognition of Rajbangshi language, is now looking to meet Union Home Minister Rajnath Singh next month. The decision to intensify the situation and to take up the matter with the Centre has come in the wake of Bengal Chief Minister Mamata Banerjee's visit to North Bengal, where she is expected to set up boards for development for the Khas and Gurung communities ahead of the municipal election in 2017. The CM will also hold an administrative meeting to declare a slew of projects for the development of North Bengal. KPP's meeting with Rajnath Singh is significant because it will put pressure on the Mamata government, as it has not yet accepted the demands of KPP. The Khas Janjati Sangha, as well as the Bharatiya Khas Hitkari Sammelan, has already declared that they will provide a warm welcome to the chief minister on 22 September by wearing traditional attire. KPP president Atul Roy said, "We have already sent a memorandum to chief minister Mamata Banerjee on Tuesday again before her visit, requesting her to look into the matter of giving recognition to Kamtapuri and Rajbangshi language, but she did not responded to their demands and as a result, we will meet with Rajnath Singh next month and place the demands." Roy said, "Before the 2016 assembly election, TMC had urged us to support them in the hills and assured them that they will look into the issue of accepting Kamtapuri and Rajbangshi as state language, but it did not see the light of the day yet." In 2001-2002, KPP had staged aggressive protests in North Bengal. The erstwhile CPIM government had failed to look into their demands. 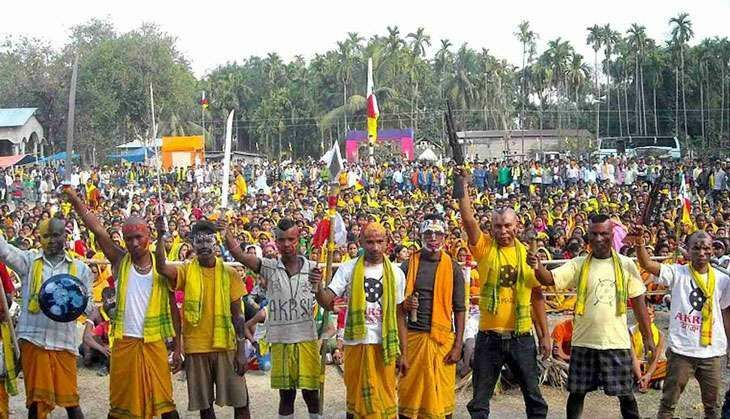 Now the KPP has turned to the TMC as the party gained a wide support base in North Bengal as 30% of the population belongs to the Rajbangshi and Kamtapuri communities. According to the members of KPP, a meeting was convened on 25 March 2016 with former North Bengal development minister Goutam Deb. Deb had assured them that if they supported TMC in the assembly election, they would look into their demands. But even now, the government is yet to look into the matter. The KPP has also sent several deputations to the chief minister requesting her to look into the matter, and also sought a time at Nabanna for a meeting, but they have not been entertained till now. KPP officials said that they had also met with Darjeeling MP SS Ahluwalia earlier and that Ahulwalia has assured them that Centre is considering of recognising Kamtapuri and Rajbangshi as the state language after discussing the issue with the Home Minister. Roy said, "We will launch a massive agitation if our demands are not met and we will meet with the state home secretary - Malay De - regarding the matter some time this month."